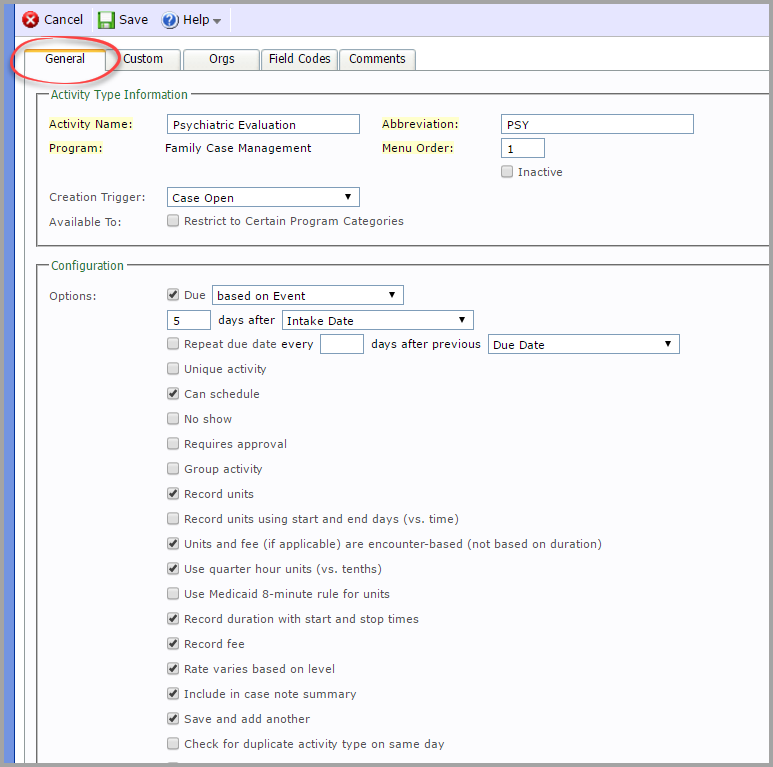 This article is meant to assist you with the details in Adding and Maintaining Program Activity Types. 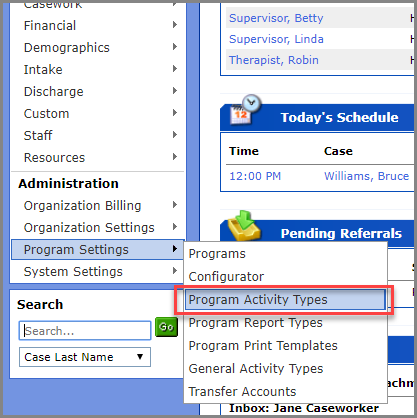 Program Activity Types control your list of available Activities within a particular Program. Activities are events that occur at a certain point in time and need to be documented. These are typically social work contacts such as a home visits or collateral contacts such as phone calls, letters, or email. Activities usually have an associated case note or narrative and may also have associated file attachments. You must be an Agency Administrator to access the “Administration” menu on the left side of your Workspace. Go to “Program Settings” and click on “Program Activity Types”. 1. 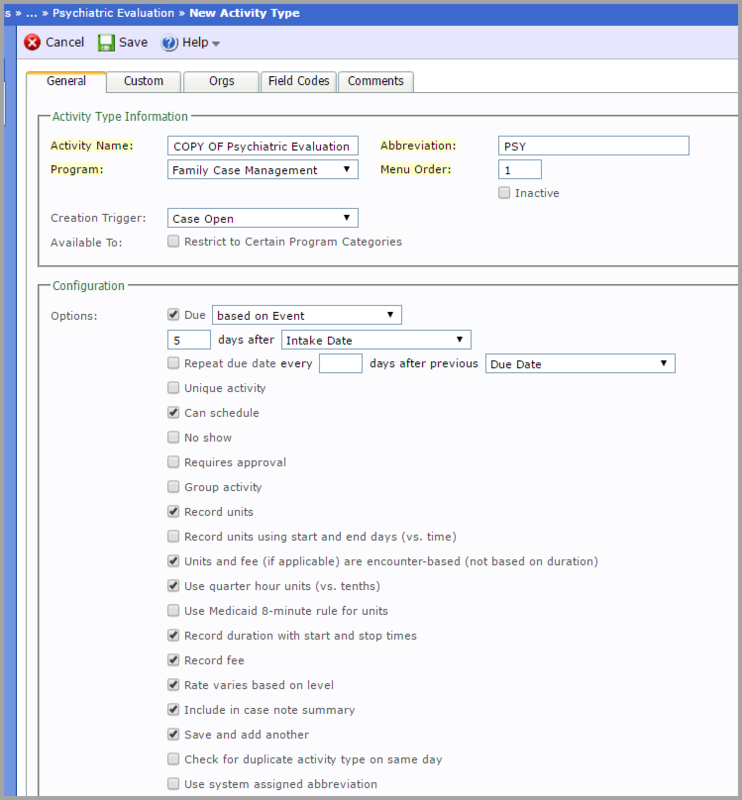 Once in “Activity Types, select an existing activity from the list or create a new one by clicking “Add Activity Type”. 2. 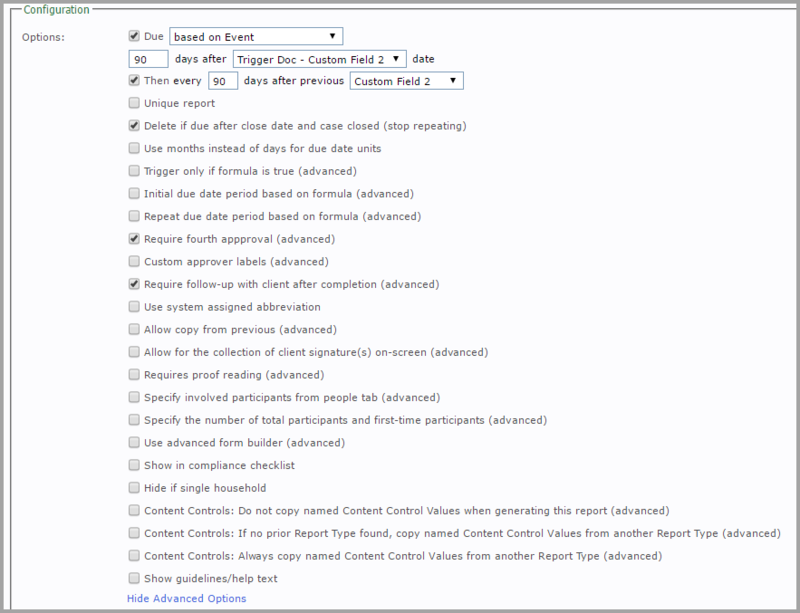 If Cloning an Activity Type, click on “Clone Activity Type” within an existing Activity Type. 3. If editing an existing Activity Type, click on “Edit”. Create Trigger(s) If you would like an activity to be triggered based on the occurrence of another event, you can select one of these options. See Due Dates in Related Topics for more detail. Unique Activity This advanced rule is available if you click on “Show Advanced Options” at the bottom of this list. Record Units using start and end days Versus standard unit of time. Allow user to specify fee/unit rate per activity This advanced rule is available if you click on “Show Advanced Options” at the bottom of this list. CPT Code varies based on level This advanced rule is available if you click on “Show Advanced Options” at the bottom of this list. Default activity date to blank instead of today This advanced rule is available if you click on “Show Advanced Options” at the bottom of this list. Do not create claim This advanced rule is available if you click on “Show Advanced Options” at the bottom of this list. Use separate claim This advanced rule is available if you click on “Show Advanced Options” at the bottom of this list. Submit claim to secondary insurance first (if one exists) This advanced rule is available if you click on “Show Advanced Options” at the bottom of this list. Use multiple CPT Codes This advanced rule is available if you click on “Show Advanced Options” at the bottom of this list. Authorization is not required/optional This advanced rule is available if you click on “Show Advanced Options” at the bottom of this list. Authorization is never used/hidden This advanced rule is available if you click on “Show Advanced Options” at the bottom of this list. Invoice zero amounts This advanced rule is available if you click on “Show Advanced Options” at the bottom of this list. 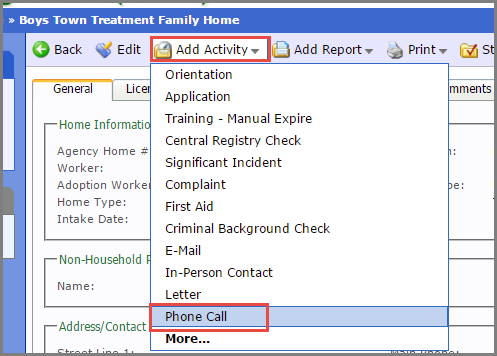 Show guidelines/help text Add a message you want your user to see when they use this Activity Type in the eR system. Unit Length Fill in the amount of time equal to one unit. Unit Type Select the type of service this is, from the drop-down menu. Place of Service Select the location of this service from the drop-down menu. Rate Level Select the type of service from the drop-down menu. Rate Add the rate this level receives per hour. CPT Code Select the CPT Code for this service from the drop-down menu. Type Select the template type you want from the drop-down menu. This narrative format is mandatory Check the box if this format is required when workers make notes in this Activity Type. Narrative Add the narrative with Custom Field Codes, from the “Custom” Tab, if you wish. 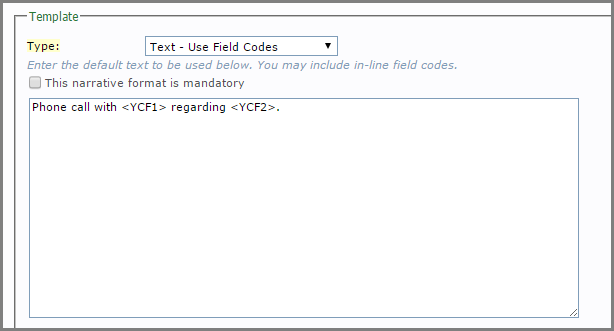 For more support regarding Custom Fields, see Related Topics. This narrative will appear when you access this Activity Type in the eR system. 6. Activity Type Complete and Usable. 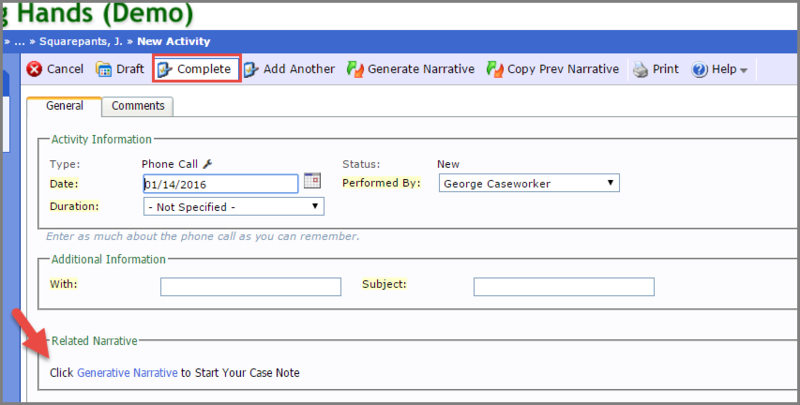 Your new activity is now accessible from your Workspace within a case, and usable in your agency’s workflow.